SpaceX’s tri-core Falcon Heavy rocket breathed fire for the first time on Wednesday atop its Kennedy Space Center Launch Pad, igniting all 27 Merlin engines on the rocket’s business end for a 12-second test firing designed to collect valuable data – not only on the behavior of the engines but also the rocket’s structure as a whole. Data gathered from Wednesday’s critical test firing will help SpaceX solidify schedules for Falcon Heavy’s big day, currently looking at early February for the long-awaited maiden flight. Falcon Heavy – the most powerful rocket of the current millennium – harnesses the power of three Falcon 9 cores operating in unison, giving it enough boost to lift nearly 64 metric tons into Low Earth Orbit or sending over 16 metric tons off toward Mars. The first flight vehicle comprises a pair of previously-flown Falcon 9 stages as side boosters, a beefed up core stage equipped to deal with the loads transferred from the strap-on boosters, and a factory-new second stage identical to that of the Falcon 9 rocket. 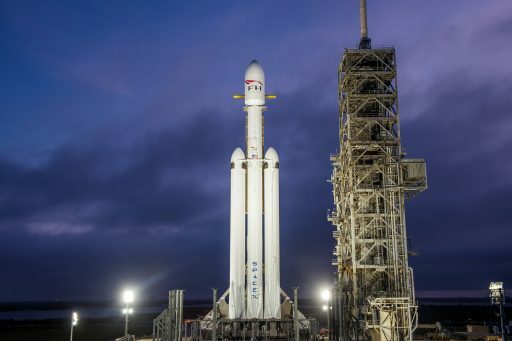 Eagerly awaited by space fans around the globe, Falcon Heavy’s debut will mark one of the spaceflight highlights of 2018, but, as SpaceX Chief Elon Musk cautioned, there is a long list of items that are “impossible to test on the ground” – making Falcon Heavy’s inaugural mission dicey business. 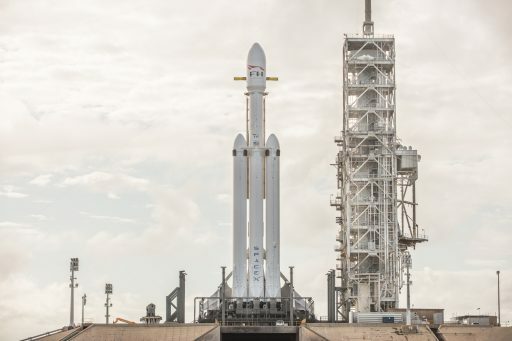 Even more so than maiden missions of other orbital-class vehicles given the sheer size of the Falcon Heavy – standing 70 meters tall, measuring over eleven meters from side to side and holding over 1,300 metric tons of densified propellants when lifting off. Instead of boilerplate mass simulators flown by other rockets on their inaugural missions, Musk chose a more colorful payload for Falcon Heavy’s maiden voyage: a cherry-red Tesla Roadster from one of his other entrepreneurial ventures. 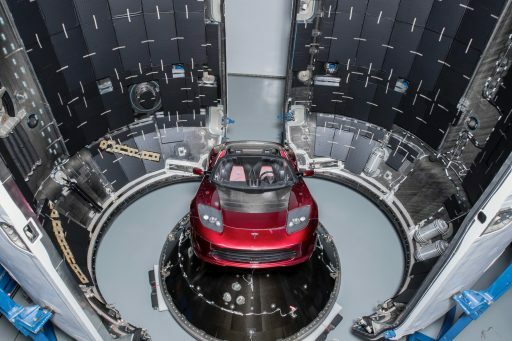 If all goes well, Falcon Heavy is planned to send the automobile into an elliptical heliocentric orbit venturing as far as the distance of Mars. SpaceX’s heavy-lifter had a very long road to launch. When Falcon 9 entered service in 2010, Falcon Heavy was expected to follow in its footsteps within three years. 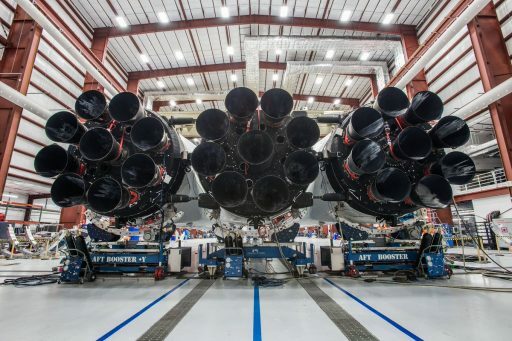 However, as detailed by Elon Musk in 2017, SpaceX were naively entertaining the idea that Falcon Heavy would simply be three Falcon 9 cores strapped together. As development work turned out to be much more complex, SpaceX placed focus on upgrades from the initial Falcon 9 v1.0 to the v1.1 debuting in 2013 and eventually today’s Falcon 9 FT that has been in operation since late 2015 and is expected to step up to the Falcon 9 Block 5 in the near future as the final design iteration of the vehicle. While the progress made on Falcon 9 – including strides in the area of re-use – aided the development of Falcon Heavy, the process of getting the vehicle to the launch pad still included a wealth of R&D work by the California-based company to ensure three cores could be operated together. Particular focus was on vehicle dynamics as the rocket has to deal with a tripling of the acoustic and vibration environment of Falcon 9, the loads experienced in flight will be vastly different from Falcon 9 in critical areas such as MaxQ and the trans-sonic flight regime, and the separation of the two side boosters was a completely new area for SpaceX. The design that eventually emerged comprises a highly modified Falcon 9 first stage as central core and two side boosters that can be easily converted between their role as main stage for Falcon 9 and strap-on for Falcon Heavy. The need for a completely re-designed air frame on the central core arises from the loads input from the two side boosters which would overwhelm qualification limits for Falcon 9’s structure by a wide margin. Falcon Heavy’s inaugural launch features core B1033 as the central core incorporating the reinforced airframe needed for load transfer from the twin boosters: B1025 from the Dragon CRS-9 launch and B1023 from the Thaicom-8 mission – making it the first Falcon 9 stage from a Geotransfer mission to be re-flown. All three cores have been acceptance-tested at SpaceX’s McGregor facility via individual, full-duration static fire tests for each core. Firing up all three cores together was seen as one major hurdle to be cleared as SpaceX identified a number of areas where lighting 27 engines at once is vastly different than igniting nine. Therefore, much focus was on Wednesday’s static fire test to see whether a clean ignition could be achieved with the procedure SpaceX had worked out: igniting the engines in staggered pairs to avoid excessive thrust torques which – in a worst case scenario – could rip the vehicle up on the launch pad. With 27 Merlin 1D engines on its three cores, Falcon Heavy is only three short of the Soviet N1 moon rocket that had 30 NK-15 engines clustered beneath its first stage. If flying successfully, Falcon Heavy would be the only launch vehicle in space history to master the operation of this many engines as the N1 never made it through first stage flight on its four missions between 1969 and 1972. Given the concerns associated with the engine ignition sequence, achieving a clean start-up and steady-state operation of Falcon Heavy’s 27 Merlins was a prime objective of Wednesday’s test. However, the test went beyond only testing the engines and their interaction as it was the first firing of the integrated Falcon Heavy and represented the first opportunity of comparing structural data for the actual flight vehicle with SpaceX simulations and models. 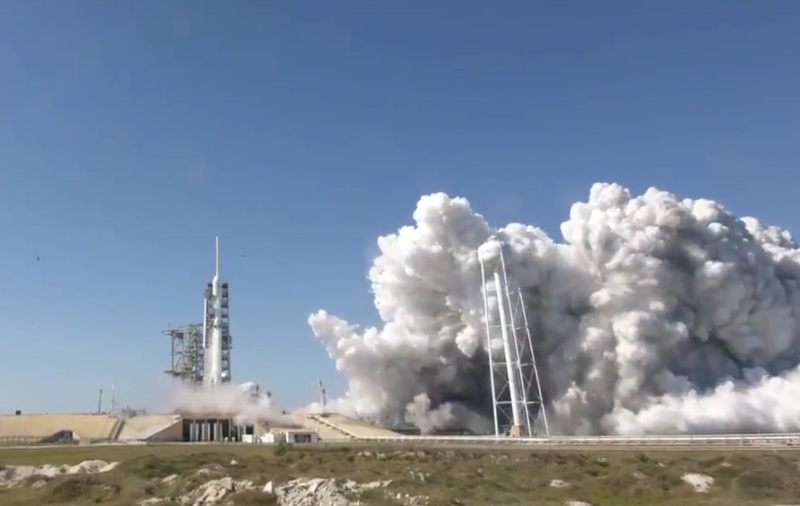 Getting to the point of engine ignition took SpaceX a number of attempts. Falcon Heavy had its first day out on December 28 when the fully integrated stack rolled up the ramp to LC-39A and was placed in its vertical liftoff position. This enabled a number of fit checks to be performed with the revamped launch pad and Transporter, Erector & Launcher (TEL) that received a number of additions to deal with fueling the triple core vehicle. Falcon Heavy moved back into its Horizontal Integration Facility after one night on the pad and returned to LC-39A on January 9. An initial Wet Dress Rehearsal on the 11th achieved a full load of sub-cooled Liquid Oxygen and chilled Kerosene propellant on the vehicle but did not get to the point of firing the engines – which had not been unexpected as SpaceX lined up the initial tests as WDRs with the potential of turning into Static Fires if absolutely no problems would come up during tanking. Teething issues with a new rocket of this size, plus a wealth of new ground systems, did not come as a surprise and SpaceX engineering teams were seen working at various areas of the TEL over a number of days. 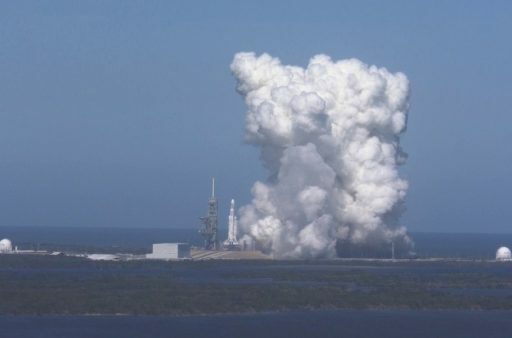 Falcon Heavy went horizontal several times and at least two more WDRs took place on January 14 and 20 before Cape Canaveral operations had to stand down due to the U.S. Government Shutdown, pushing the Static Fire Test to a six-hour window opening at 17:00 UTC on Wednesday. Falcon Heavy completed its momentous Static Fire Test at 17:30 UTC and, going by visuals alone, the firing appeared to end before hitting its 12-second target duration – sending a rumble across Cape Canaveral that appeared to surprise even seasoned space reporters as Falcon Heavy pumped over eighty metric tons through its engines over the course of the test. 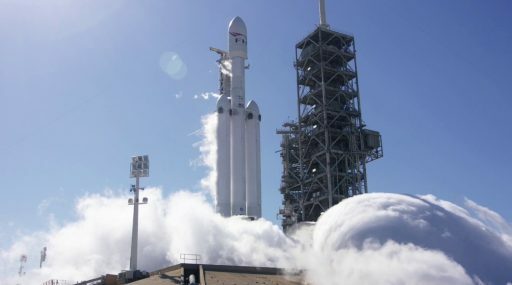 Falcon Heavy’s roar was heard nearly 50 Kilometers from Cape Canaveral and provided a preview of what’s in store for the rocket’s maiden launch that will operate the first stage engines at a thrust setting of 92% – creating a combined thrust of almost 21,000 Kilonewtons, 2,140 metric-ton-force. Per the established procedure for Falcon 9 testing, SpaceX engineering teams went into an immediate review of data collected during the test to verify the target duration was achieved and the necessary performance parameters were captured before committing to de-tanking the vehicle. A Tweet by Elon Musk indicated this review yielded positive results. The forward plan for Falcon Heavy solely depends on the rocket’s performance on Wednesday as a number of in-depth reviews are ahead for SpaceX to pick apart all data collected during the test to give Falcon Heavy the green light to either press into a second Static Fire test or proceed into a launch flow. 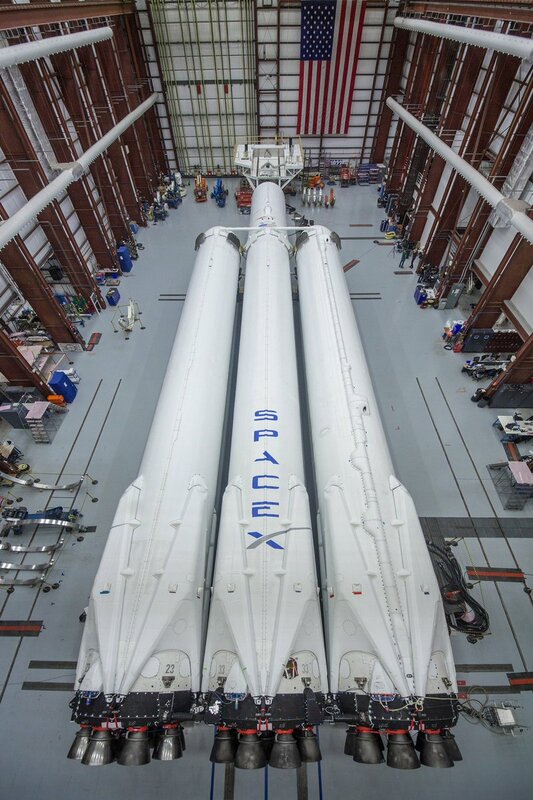 While Falcon Heavy occupies Launch Complex 39A, Space X is continuing business as usual at Space Launch Complex 40 and is likely to give priority to scheduled Falcon 9 missions since these flights pay the bills. The next Falcon 9 – a flight-proven vehicle – is set for its own static fire test in the coming days to set up for a January 30 liftoff with the SES 16 / GovSat-1 satellite. Another two Falcon 9s, one from Vandenberg & one from Florida, are on the manifest for February.